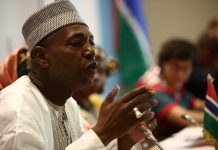 Reports reaching the Daily News is that Former Speaker of the National Assembly of the Gambia in the second republic, Fatoumata Jahumpa Ceesay has been arrested by the police. According to sources closed to the Gambia Police Force, the former Speaker was arrested earlier yesterday after she arrived in Banjul from Senegal Dakar where she has been staying. Fatoumatta Jahumpa Ceesay, commony call FJC who currently in police custody is said to has been arrested over alleged interference with a witness of the Truth, Reconciliation and Reparations Commission (TRRC). It would be recalled that last week Thursday, former army corporal, Alagie Kanyi told the TRRC during his appearances said Touray and Jahumpa told him not to mind the TRRC. The commission ordered the police to arrest the two for alleged interference in its work.